Strasburg Scooters offers guided tours on 50cc scooters, allowing guests to get up close and personal with Lancaster County, Pennsylvania. Guests may enjoy a guided covered bridge tour, Bridges and Beer Tour, Amish Country Mystery Tour and more, all through the back roads of Amish Country. Ride alongside horse and buggies as well as past Amish schoolhouses with an experienced guide. All tours are led by an experienced guide. Strasburg Scooters strives to provide first class customer service, while offering guests the opportunity to experience the area. 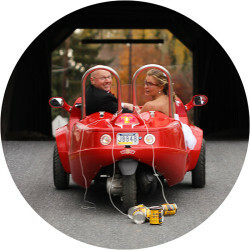 Owners, Marc and Nikki Crusemire, are involved in every aspect of the business, from creating tours and routes to checking in guests and refueling scooters. Customers are not customers at Strasburg Scooters, they are guests in the extended home of Marc and Nikki. Both owners expect their staff to set the bar in customer service and treat every guest as they would like to be treated if they were on the tour. Strasburg Scooters expects the best out of their staff, which is why only the best are hired to be a part of the team.